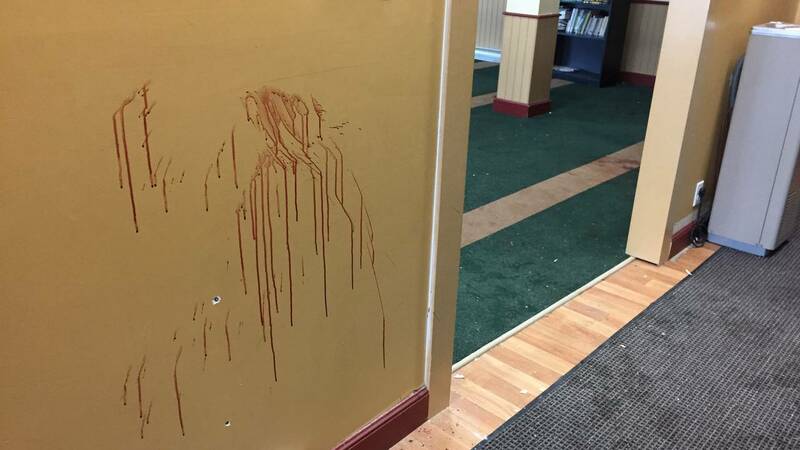 A wall at the Quebec Islamic Cultural Center, where six people were killed in 2017, is seen here stained with blood and dotted with bullet holes. (CNN) - A man who killed six worshippers at a Quebec City mosque told an investigator he carried out the January 2017 attack after seeing reports the Canadian government would welcome more refugees into the country, according to CNN partner CBC. A video of Alexandre Bissonnette's interrogation was played in court Friday during the third day of his sentencing hearing, CBC reported. Bissonnette pleaded guilty to six counts of first-degree murder and six counts of attempted murder in March. In the interrogation video, Bissonnette said he was watching TV reports about the Canadian government's policy of welcoming refugees. "The Canadian government was, you know, going to take in more refugees, you know, those who couldn't go to the United States would end up here," Bissonnette told Quebec City police Sgt. Steve Girard during an interrogation. "I just lost it." The day before Bissonnette stormed the mosque, Prime Minister Justin Trudeau tweeted that Canada would embrace refugees escaping oppression and tyranny, a move that came as President Donald Trump first instituted his immigration ban. "To those fleeing persecution, terror & war, Canadians will welcome you, regardless of your faith," Trudeau tweeted on January 28, 2017. "Diversity is our strength. #WelcomeToCanada"
Bissonnette told Girard he wanted to save people from terrorist attacks, according to CBC, and that "maybe, thanks to what I did, there will be hundreds of people saved." He said he had been obsessing for months over the idea that his parents or twin brother would be victims of a terrorist attack after a string of such attacks in Europe. "I had to do something, it was torturing me inside." On January 29, Bissonnette entered the Quebec Islamic Cultural Center and fired indiscriminately into a crowd of men, women and children, according to witnesses. When it was all over, Bissonnette had killed six Muslim worshippers -- Mamadou Tanou Barry, 42; Abdelkrim Hassane, 41; Khaled Belkacemi, 60; Aboubaker Thabti, 44; Azzeddine Soufiane, 57; and Ibrahima Barry, 39.